The results are in for this year’s Visit Orlando Magical Dining Month sponsored by American Express, and a record amount was raised for local charities. 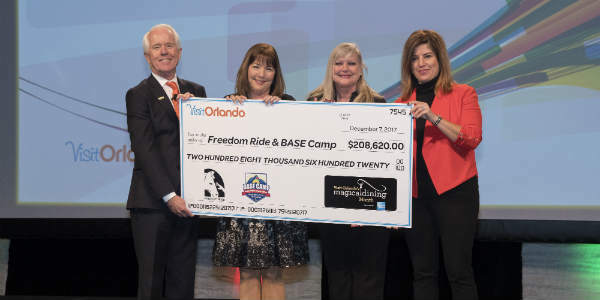 From Aug. 25 to Oct. 12, guests enjoyed three-course, $35 dinners at a record 118 restaurants across Central Florida., and $1 from each meal was donated Freedom Ride Inc. and BASE Camp Children’s Foundation. This year far exceeded expectations with a record $208,620 raised for the charities! Freedom Ride provides therapeutic horseback riding to people of all ages coping with physical, emotional and learning disabilities. The donation from Magical Dining will significantly help in the organization’s goal of building a covered arena for year-round riding in all weather conditions. BASE Camp works to ease the stress of children and their families suffering from cancer and other life-threatening hematological illnesses. Proceeds from Magical Dining will help fund support programs such as Second Wishes, which provides children with a recurrence of cancer the opportunity to experience another once-in-a-lifetime wish. Additional information about Visit Orlando’s Magical Dining Month, including a list of restaurants that participated, is available at OrlandoMagicalDining.com.